Grab your parkas and fill up a thermos with something hot because major junior hockey is going to brave the elements with a game outside. 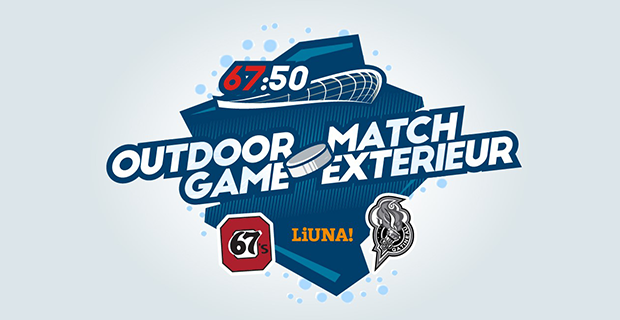 The Ottawa 67s will host the Gatineau Olympiques on Sunday, December 17 at 3pm in The Stadium of TD Place in Ottawa’s Glebe district. It will mark the first time an outdoor CHL contest will be played in Ontario. Four years ago, the Saginaw Spirit, Windsor Spitfires, London Knights and Plymouth Whalers set an attendance record of 26,384 spectators when they skated in the 2013 Hockeytown Winter Festival. The event was held at Comerica Park in Detroit, Michigan. The 2015 QMJHL Winter Classic also tasted the frozen waters in Saint-Tite, Quebec with a pair of games between the Shawinigan Cataractes, Victoriaville Tigres and Quebec Remparts. Those games drew crowds of 5,996 and 7,323. The Stadium at TD Place seats 34,000. “This is a great day for hockey fans and families in the Ottawa/Gatineau region,” said Gilles Courteau, CHL Vice President and Commissioner of the QMJHL. The stadium ice surface, rink boards and related equipment required to stage a world-class outdoor game will be provided to the 67’s by the NHL, which is presenting the Scotiabank NHL 100 Classic outdoor game between the Montreal Canadiens and Ottawa Senators the night before the 67’s and Olympiques’ historic match-up. “The game will be a great opportunity for the kids on both teams,” said Ron Choules, Gatineau assistant coach. Tickets for the outdoor game will be priced at $15 for general admission and $20 for reserved seating. A ticket to the contest also includes free transportation to the game. Sorry, long johns and toques not included.